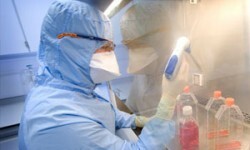 Update on Phase II/III Clinical Trial of Investigational Staphylococcus aureus Vaccine, V710. The share of Intercell crashed seriously. Merck, known as MSD outside the United States and Canada, and Intercell AG today announced that following a pre-specified interim analysis from the Phase II/III clinical trial evaluating V710, an investigational vaccine for the prevention of Staphylococcus aureus (S. aureus) infection, the independent Data Monitoring Committee (DMC) recommended suspension of enrollment.